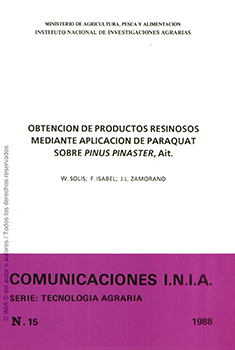 The aim of this work is to set up a new methodology to obtain resinous products from Pinus pinaster Ait., which is compatible with lumbering and pulping profit, as an alternative and/or to complement the conventional methods of extraction. The different techniques tested are described, analyzing their advantages and inconvenients to induce the lightwood by the use of paraquat phytocide, from which are determined the most effective dose in each case, as well as to evaluate of lightwoods that are induced and the possibility to increment the resinous products. Physical Description : 38 p; 17x24; il. INIA. Servicio de Publicaciones. Ctra Coruña km 7,5. 28040 MADRID. Contact: distri@inia.es. Tel: (34) 91-3471493. This book was added to our online catalog on Tuesday 08 January, 2013.